Hydrogen is the most abundant element in the cosmos, and its behavior at high pressure is crucial for a broad range of problems from condensed matter physics to astrophysics to stockpile stewardship. The structure of hydrogen in the dense molecular state remains challenging both experimentally and theoretically. Working with CDAC scientists at Carnegie, Visiting Scientist Pierre Toledano of the Universite de Picardie developed a group-theory approach and combined it with available experimental data to predict the structures of the elusive high-pressure, low-temperature broken symmetry phases of solid molecular hydrogen (phases II and III). Data from spectroscopy and diffraction experiments do not provide unambiguous structural information for these orientationally ordered phases, but do suggest that the corresponding transitions are quasi-continuous and not reconstructive. This fact allows the use of the Landau theory to predict potential structures of the high pressure phases by constraining the number of possible mechanisms available for their formation. Analysis of the behavior of order parameters with pressure suggests that H2-II has a partially ordered structure, while H2-III has an ordered isotranslational structure. 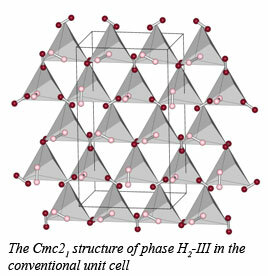 In addition, the existence of another high-pressure phase, H2-I' isostructural with H2-III, has been predicted. This new phase is defined by a boundary in the phase diagram that meets the boundaries of H2-I and H2-III at second triple point. The results have important implications for metallization predicted at higher pressures molecular systems [P. Tolédano, et al., Phys. Rev. Lett., 103, 105301 (2009)].